For most of the state, and especially the Bay Area, the drought is officially over, for now. While it's been great to refill reservoirs and aquifers, not all of the rain has been good for our gardens and landscapes. Many plants have become waterlogged, showing signs of stress through their leaves, which might have twisted and turned yellow or brown. Water stressed plants also might have darkened veins and midribs. The plant often will lose its leaves and new shoots might wither and die. The symptoms of too much water mirror those of too little water, and there's a reason for that. In both conditions, the plants are robbed of oxygen and nutrients. Fortunately, the time of year might save many plants. During the winter months most plants are in a dormant or slower state of growth so less damage occurs versus summer floods or monsoons when the plants are actively growing and taking in oxygen and nutrients from the soil. • Stay off wet soil as much as possible. Compaction will only increase the risk of damage. • Wait until all chance of frost has passed, then trim off damaged branches, shoots and leaves. • If you are growing in containers, make sure to elevate the pot a few inches off the ground so that water can drain through and away from the roots. If possible, remove the plant from the container and place it on cardboard or newspaper overnight to let it drain. Clean the pot and replant with fresh potting soil and slow-release fertilizer. • If you are in an area that has flooded, it may be best to discard edible plants that have been submerged in water. According to research from North Carolina State University, flood water may carry pathogens such as E. coli, Salmonella, Hepatitis A and norovirus. The water can spread contaminants throughout the entire garden especially if there is livestock, a pet area or compost pile nearby. • Produce that is consumed raw, including soft fruit like berries, should definitely be discarded. Plants that were in flower during the flood might be safe, but it's probably best to throw them away as well. • Root crops that have four or more weeks left before harvest should be OK, but they need to be washed and rinsed thoroughly before eating. Canning produce is not advised. • Add compost and mulch in late spring or early summer to help reestablish nutrients in the soil. • If you lose some plants or trees, plant new ones on mounded soil that has been well amended to improved drainage. 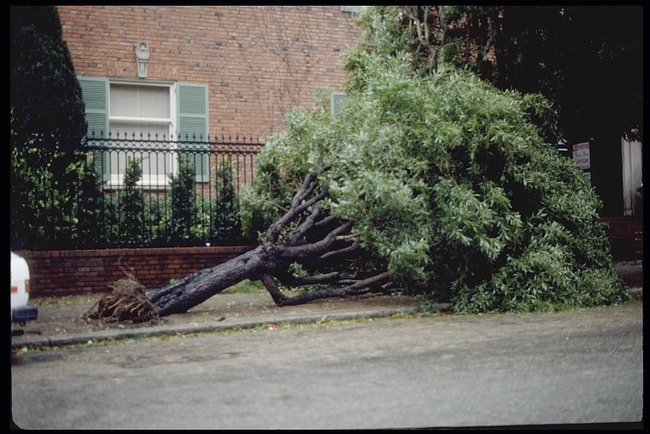 • If you are concerned about a tree coming down, consult with a licensed arborist. • Don't be too quick on the draw with those pruning shears and shovels. Plants are amazingly resilient and may make a full recovery once the rain stops and we get more sunny days. This article first appeared in the March 5 issue of the San Jose Mercury News. A number of years ago I was on a tour of Highgrove Royal Gardens in England. At this, the private residence of Their Royal Highness, we marveled at the beautiful hostas and ooohed and aaahed over the meadows of wildflowers. It was all quite stunning, my dears. And at the end of the tour guide slowed her pace. She lowered her voice nearly to a whisper as she announced “And here … we have … the California Wild Lilac!” Sounds of delight and awe rippled through our tour group. My colleague and I exchanged quick glances—so much build up for a native California plant that we routinely fly by on the highway without a second thought (no booing here, I truly love our hardworking ceanothus). And I couldn't help but think about how much coddling and care must go into keeping that Mediterranean climate-loving shrub happy so far from its native soil. Water the ground around your plants thoroughly to moderate the soil temperature and protect the root zone. Wrap (non-LED) holiday lights around the branches of your shrubs and small trees. The small amount of heat they give off is often just enough to ward off the cold. And they're just so darn festive! If you haven't yet thrown out your Christmas tree, cut off the branches and pile them up at the base of your plants to keep them cozy. Any other spruce/pine boughs will do. Purchase floating row cover from a garden supply store or forage burlap sacks from your local coffee roaster. Wrap and/or drape either of them lightly over your plants. Then enjoy a cup of coffee. Bring potted succulents or other tender plants up on the porch where they can bask in the radiant heat of your house. Build an elaborate PVC or wood frame around your plants and drape plastic over them. No, on second thought, don't do this. Choose plants that are more suited for your area and you can avoid this all together! This article first appeared in the January 20 issue of the Morgan Hill Times. By growing different varieties in your garden, you can pick berries year round! There's no doubt Californians have a love affair with strawberries. The delicious berry is the state's fifth most valuable crop, and California farmers are responsible for about 80 percent of all the strawberries grown in the nation. The home gardener loves them, too, and because of our climate and the variety of berries available, we can enjoy pretty much a year-round harvest. Berries like full sun and soil that drains well. They also need potassium, so add pot ash when planting in clay soil. Don't plant where you have grown tomatoes, eggplants or peppers as strawberries are susceptible to verticillium wilt, a fungus that can infect the soil and damage or kill the plant. Strawberries have shallow roots and need to be watered frequently. Keep plants moist but not soggy. Strawberries do best when refreshed every year. Dig up and discard of the mother plant. Snip off and replant the healthiest runners that are putting out strong roots and, to ensure large harvests and superior taste, plant new plants every 3 to 4 years. 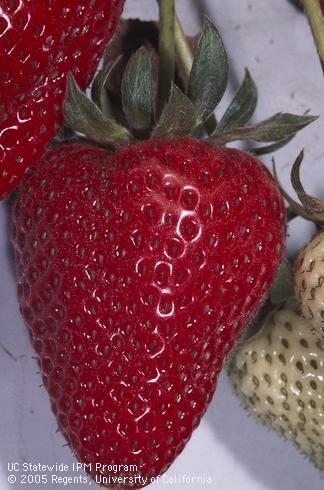 Strawberries fall into three primary categories: Everbearing, day neutral and June bearing. Everbearing requires long days of sunlight to set fruit and, although they don't bear all year-round, they produce multiple crops in spring, summer and fall. • Mara Des Bois, developed by a French breeding program, produces small, extremely fragrant, very flavorful fruit. • Quinault produces up to 2 inch berries that are exceptionally sweet, great fresh or in preserves. It grows well in containers. • White Carolina, or pineberry, is a unique white to pale pink berry that tastes like a cross between a strawberry and a pineapple. It produces medium size fruit from spring through fall and is heat tolerant and disease resistant. Day Neutral berries do not depend on a set number of daylight hours in order to flower. They are a great choice if you want a small amount of fruit throughout the year. • Alpine, sometimes thought of as wild strawberry, is a compact, clumping variety that can be grown in part sun. It has small, aromatic, rich tasting berries. Plants do not sent out runners so it makes a great edging option. • Albion produces large, firm very sweet berries. It is disease resistant but needs more water and nutrients than other varieties. It spreads out rapidly, so space accordingly. • Seascape, produced by the University of California in 1992, is productive. Many think it has the best flavor that any of the day neutral varieties. June bearing strawberries require short day lengths, as in the fall, in order to flower. They are the most widely grown berry and make up the bulk of what you find at the supermarket. They tend to be vigorous plants, putting out lots of long runners, so require room to grow. They are prolific producers of large fruit, but since the fruit comes on all at once you have to use it all pretty quickly. They are great for jams, jellies and pies. Unlike the name implies, they don't all produce in June. • Chandler offers good color and flavor, and the fruit holds well on the vine. It is susceptible to anthracnose disease. • Earliglow is known for its wonderful strawberry flavor. The fruit is sweet, firm and medium sized. It produces vigorous runners, so give it plenty of space. This article first appeared in the February 1 issue of the San Jose Mercury News. 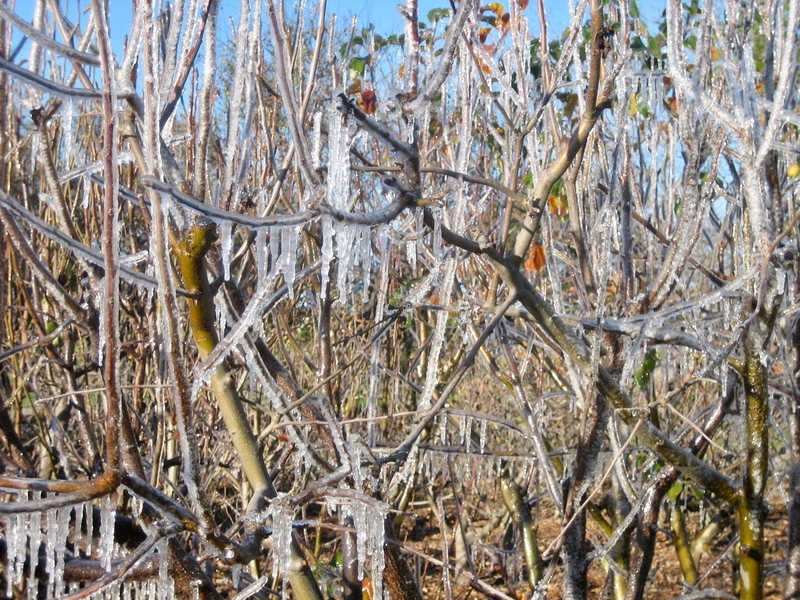 Frost damage to plants is the single biggest cause of economic loss to crops in the United States – far surpassing any other weather related issue. While frost doesn't impact the home gardener on the same scale, it can be disheartening to lose plants in a sudden freeze. Citrus, succulents, newly planted or tender perennials, and many tropical and subtropical plants all are vulnerable. Frost damage occurs when the water inside the cells of a plant freeze, causing damage to the cellular walls, which degrades the overall health of the plant. Affected plants will wilt and in severe or prolong periods of frost, die. Shoots, buds and flowers will wither and turn brown or black as if they have been scorched. Even bark can crack or split and die off. Young, newly planted, specimens are especially vulnerable. We already have had several days of frost and freeze here in the Bay Area, and it looks like more is on the way. So, how do you protect your prized citrus, succulents, rhododendrons and azaleas? If a severe freeze, or multiple days of below freezing weather is expected, water 2 to 3 days ahead of time. This will increase the soil's ability to retain and give off heat. Wrapping trunks of young trees with blankets, towels or piping insulation will provide added protection. If you are doing container gardening and are able to pull pots into the garage, shed or other enclosed area, that would be ideal. Otherwise, move them up against the side of the house or garage, preferably beneath an overhang. Stringing your plants with old-fashioned, incandescent Christmas lights –not LEDs — can be very helpful. Covering the lighted plants with frost cloth, sheets or blankets will add 4 to 8 degrees of protection, enough to keep most plants alive. Frost cloth is lightweight enough to leave on for several days, however heavier covers should be removed each day once the temperature has warmed up, and then reapplied each night before sunset. 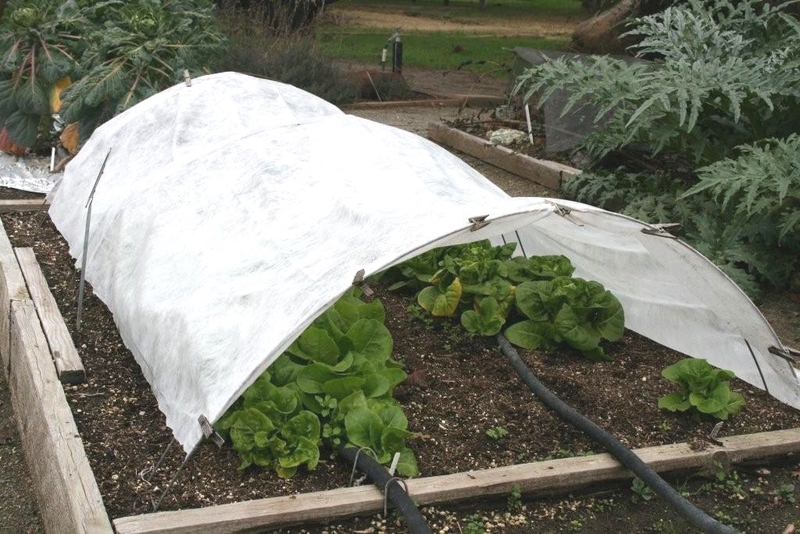 Make sure the cover goes all the way to ground in order to capture the radiant heat from the soil. Also, stake heavier covers so that the weight won't break branches, damage the leaves or suffocate the plant. You can also use inverted boxes, buckets and plant pots. Adding a 2- to 3-inch layer of mulch around your plants can also help, but be sure to stay several inches away from the trunk or stem; mulching too close will cause the plant to rot. There are many varieties of foliar sprays available today that claim to protect against frost. Although recent field trials have shown no real harm in using them, they also show have found little to no actual protection from these products. You are better off using other methods to keep your plants safe. 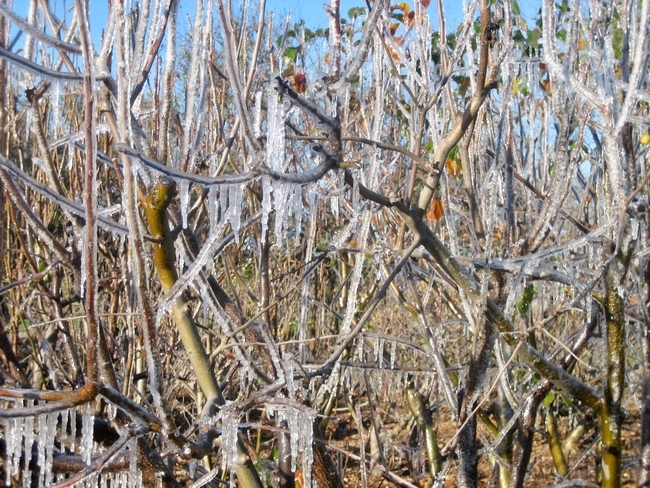 Wait until all chance of frost has passed before trimming off any damaged or diseased branches. Pruning too soon can cause significantly more trauma, even death, to a young, vulnerable plant that might otherwise have recovered in the spring. This article first appeared in the January 8 issue of the San Jose Mercury News.